As the Southwest Archery launched this tiger takedown recurve bow exclusively for the beginners to intermediate archers, they designed lower poundage from 14# to 29# and 48 to 62 inch ranges bow length which is the perfect specification for the target group. Southwest made the riser with Tigerwood to bring glitzy looks which easily attract the children or teenagers for their archery practice. The riser is made of naturally sourced wood and ergonomically designed for a comfortable grip. It is suitable both for the left-handed and right-handed shooter. The difference from other bows is its finishing – it is so glossy and smooth finished that anyone falls in love especially teenagers. The riser is also pre-drilled with brush bushing. So, you can adjust any accessories like mechanical rest/plungers, sights, stabilizer or quiver with it. The Lightweight and wooden handle allows youngsters to shot for a long time without any cramping or cold shocking. There is nothing new to say about the limbs of tiger takedown as all maintain the same tone and quality made by Southwest archery. Yes, like others, the limbs of tiger takedown also made of hard maple lamination and surrounded with black fiberglass. Tips of the limbs are reinforced and compatible with Fast Flight and Flemish. Like other southwest recurve bows the limbs are 100% interchangeable (except 54-inch little tiger). As we said the Southwest archery design this tiger bow for little stars, they keep the draw weight range fourteen pounds to twenty-nine pounds. This poundage support long time fun is shooting and target practice without putting any extra pressure on little hands. Though it designed in the lower range, it is an accurate bow for shooting on the target. The compact design and lightweight tiger bow have almost no vibration during shooting. The handcrafted riser made of naturally sourced wood which is durable and long lasting. So, compared to the price the overall performance is outstanding. The riser is come up with preinstalled threaded bushing. So, you can set mechanical rest or plunger, stabilizer or quiver as per your desire. The package also includes the following items with it. Q1: What will be the position of arrow rest for a left-handed archer? Ans: You have to set it in right side if you are a left handed archer. Q2: Is this bow withstand in wet season? Ans: Yes, it coated with waterproof varnish which is enduring against damp. Q3: Is it possible to change the limbs with sage one? Ans: No, the limb pocket of the tiger is a bit narrower than sage, so it will not fit with that. Limited range of draw weights so may not fit all. Solution: Though the options for draw weight is very few, you have a chance to change the limbs with other southwest recurve bows (except 54’’ tiny tiger). 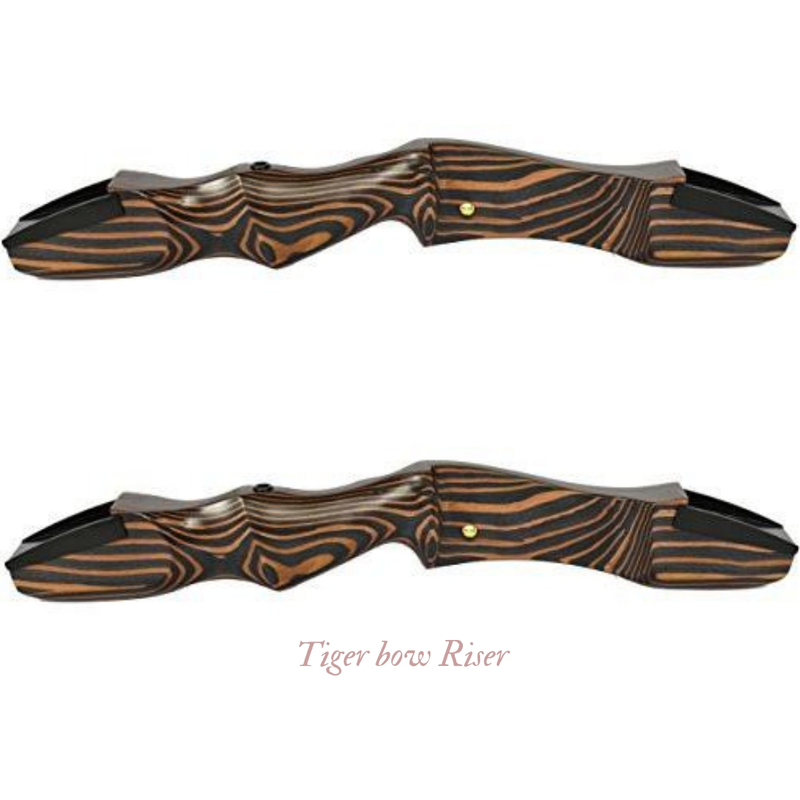 However, this tiger bow is a perfect match for beginners, and this draw weight is enough for them. The design may not be attractive to all hunters. Solution: First of all this is a fun or target practice recurve bow, not for hunting. So, those how to think to use it for deer stalking may not like its shiny appearance. For the hunter, the 62-inch tiger shark recurves bow, or Samick Sage is perfect. Solution: Usually, no bow maker include arrow with its package. However, it’s not a big deal to collect suitable arrows from the online marketplace or your nearer archery shops. Indeed, the Southwest Archery Tiger Takedown Recurve Bow is an excellent bow for both beginner and intermediate archer, for pro archers, it will not be enough. So for the expert as well as beginner archer tiger shark will be a perfect choice, no doubt. The tiger shark bow is 62 inches long, lightweight, vibrant-free, accurate and come up with a wide range of draw weight 25 pounds to 60 pounds suitable for hunting, target shooting, bow fishing, and fun. So, if you want to spend a little extra and think for future Tigershark might be the right choice for you. However, if you do just fun backyard at your home, then tiger takedown is worthy enough. Now the decision is yours. Southwest archer supplies create the beautiful compact, accurate, lightweight “Tiger Takedown Recurve Bow and Arrow Set 48”- 62" Target & Frist Bow” that is the excellent choice for just about anyone looking for an easy learn! Furthermore, it is also a new improved version and an award-winning bow for 2018, rated the perfect kit for beginners interested in Olympic recurve wooden bows. For a gift to your adored son or daughter or grandson or granddaughter, there is no alternative than the tiger takedown flashy and funny recurve bow.